I thought you might like to see how I put my outfits and make-up together. First, a little explanation about me and clothes – I wear what suits me no matter the season. I buy what I like, wear it when I like and wear it several times. I have stupidly expensive taste but I have bills to pay and they win! 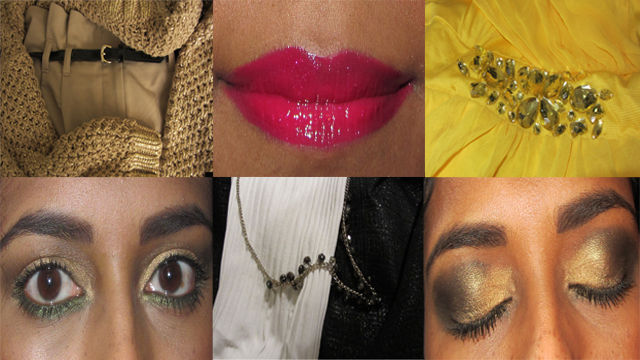 Here are some of the outfits I wore in December and the make-up to match. 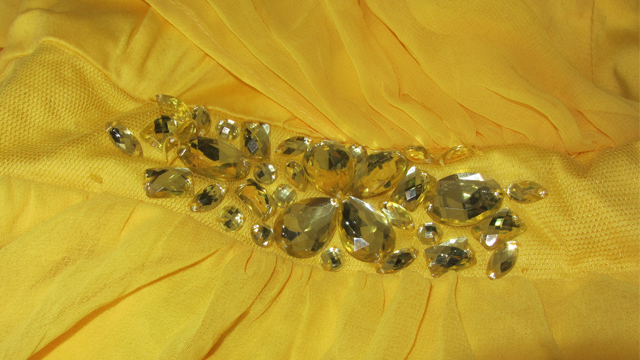 Bright yellow AX Paris dress with yellow gems . It is a strapless and fairly short dress with a floaty overlay which is short at the front and almost down to my ankles at the back. I wore grey Jones Bootmaker platform sandals and carried a pewter Armani Exchange clutch bag. 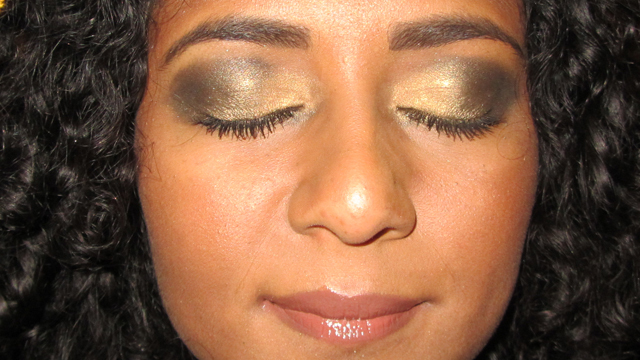 I wore this for a night out on the King’s Road with Slate and Gold make-up. 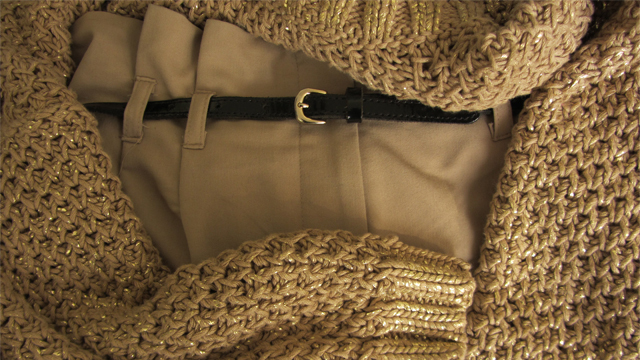 Boss Orange cropped sweater in sand and gold with Miss Selfridge high-waisted shorts in sand and FCUK skinny belt in black patent leather with a gold buckle (also with black ribbed tights which are not pictured). 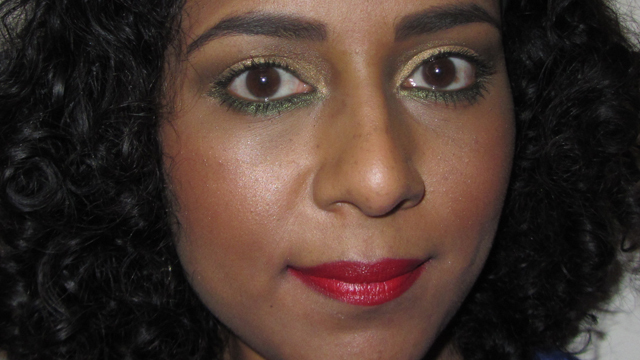 I wore this for a night in with friends and family with Simply Christmas- The Lighter Option make-up. Hugo Boss white ribbed tank top with Warehouse skirt in metallic black. I can’t remember where the necklace is from! 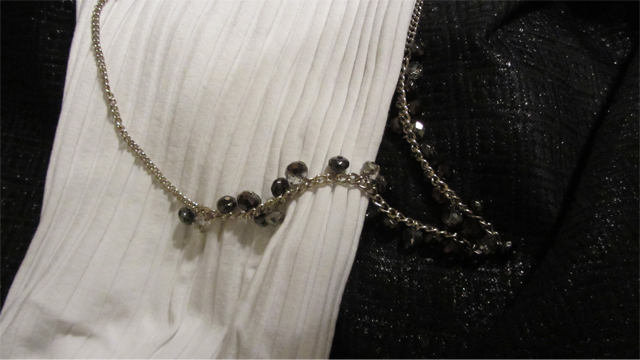 I love my dress jewellery, usually the bigger the better. I tend to buy it from Monsoon, Accessorize, New Look and Oasis. I carried a teal and gold clutch bag from Accessorize and wore Betty Jackson Black killer heeled ankle boots, all with Hot Pink Party Lips make-up. As I was choosing the pictures, it occurred to me that this is all shimmer and sparkle. My work wardrobe is very sensible – black Warehouse suits with TM Lewin shirts in any colour or Hugo Boss shirts in white, sometimes with Duchamp cufflinks. 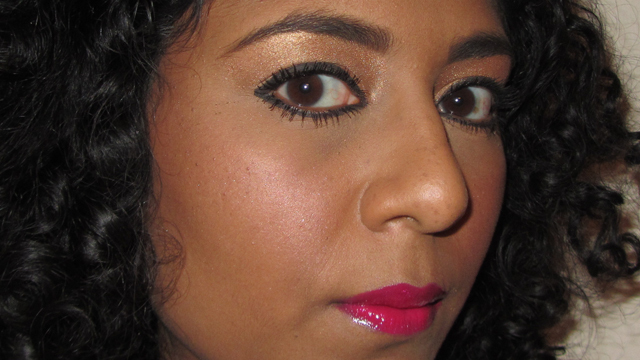 I think I will do more outfit related make-up posts in 2014, although not necessarily what I wore. Maybe I’ll draw inspiration from key pieces from my favourite shops. I’m thinking Net-a-Porter (wishful thinking! ), & Other Stories, Bershka, Hugo Boss, French Connection, Warehouse, Mango, Zara, H&M, New Look, Dorothy Perkins to name but a few – a completely random bunch!